These wide field magnifiers have a one inch working distance and a minimum of 220° access to a magnified object. Perfect for touch-ups and minute mechanical changes to the subject area. Manufactured in the USA by Edmund Scientific, the 2769 is the industry standard. It has a cutaway base which leaves enough room for strippers to get a knife under the lens. Great for countless uses where plenty of space under the lens is needed. The double achromatic lens system is mounted in a sturdy black anodized aluminum casing with adjustable ring lock focusing. The base is made of crystal clear acrylic to permit adequate light on the object. 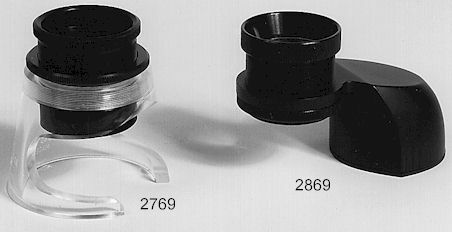 The 2769 magnifier has a lens diameter of 1 1/2" and stands 3" high. It has a 1.5" (38mm) field of view and a 6X power. The price of the 2769 is $129.95. The 2869 has a two coated achromatic photographic quality lens system and each lens has two elements. It offers adjustable focusing and a sturdy metal alloy construction of both stand and lens housing. It has a 1.5" (38mm) field of view and a 6X power. Comes complete with a lens cover. This item is an economical substitute for the 2769. Has an outstanding lens! The price of the 2869 is $69.95.